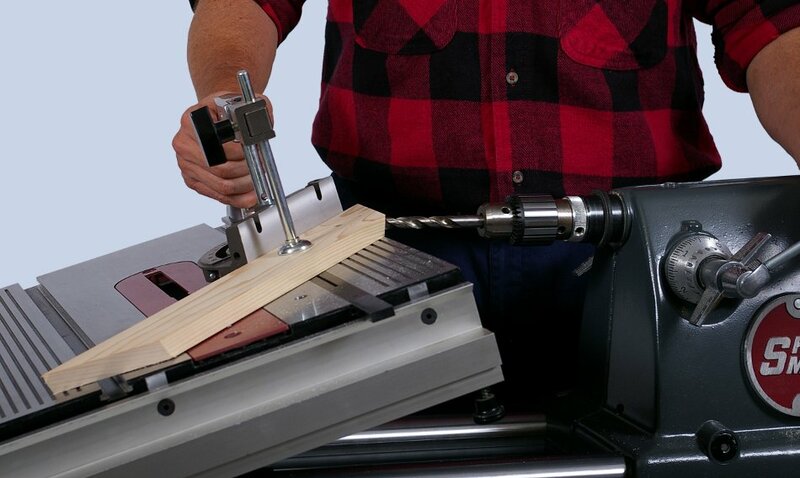 With the Shopsmith, You Can Also Share Set-ups - Saving Your Time and Improving Your Results ! 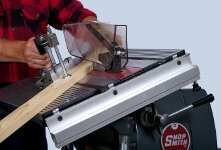 With the Shopsmith, you can set-up just once and often perform multiple operations by merely switching the spindle-mounted tool. 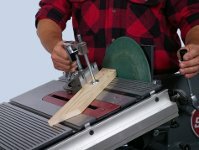 For example, in our 3-step illustration below, we tilted our worktable to 20-3/4° and our miter gauge to 49° to saw the miters for a compound picture frame having sides that tilt at a 60° angle. Now, without moving the table or gauge, we replaced the saw blade with the sanding disc and sanded the cut we just made. Next, we replaced the disc with the drill chuck and bored perpendicular dowel holes to reinforce our joints. One work-holding set-up - three quick tool changes - three different operations - zero chances for variations in the settings between individual machines ! You'll save time with the Mark 7 - achieve more precise results than with individually set-up machines - and become a proficient user much faster since you'll be using the same Worktable accessories and controls for all machine operations ! Only the multipurpose Shopsmith offers this exclusive capability !